This weekend at Shalimar golf course, many of Arizona's best teams and individuals will be hosted at Doug Conley Invitational. This invitational will feature multiple matchups between bigtime runners in the state. One of these matchups will be between Caden Hercules of Desert Mountain High School (Sr.), Ethan Mychajlonka of Basha High (Sr.), and Jacob Lewis of Boulder Creek High School (Sr.). Lewis will be the top-returning boy from last year's race having run 15:14 to finish in 4th place. However, the last time the three of them met at the Ojo Rojo Invitational, Caden came away with the win by running a time of 15:50. While these three are the current favorites individually, there are a few runners that shouldn't be counted out. Carson Klepinger of Mesa Mountain View High School is not far off, having clocked a 16:05 performance at the Fountain Hills Invitational a couple weeks back. Anthony Haren (Perry, Sr.) could also play a huge factor tomorrow. Haren recently showed the kind of shape he's in after running 14:47 in the Boys Sweepstakes 3-mile race at Woodbridge. When it comes down to the team competition for the boys, Mesa Mountain View will be going head to head with Highland High School. Highland just came off a win a couple weeks back at Desert Solstice seems to be a clear favorite. On paper, though, Mesa Mountain View High School has the faster team time-wise. Corona Del Sol and Desert Mountain could also play huge factors as they placed 2nd and 4th at the Ojo Rojo Invitational. On the girl's side, Abi Archer of Chaparral High School (Jr.) and her teammate Rachel Turner (Jr.) look to improve upon their 2nd and 3rd place finishes from last year. Archer ran a time of 17:43 last year and will return as the favorite. Caroline McLeskey (Highland, So. ), Samantha Braun (Xavier, Fr.) and Kailey Welch (Mesa Mountain View, Jr.) may also factor into the chase. 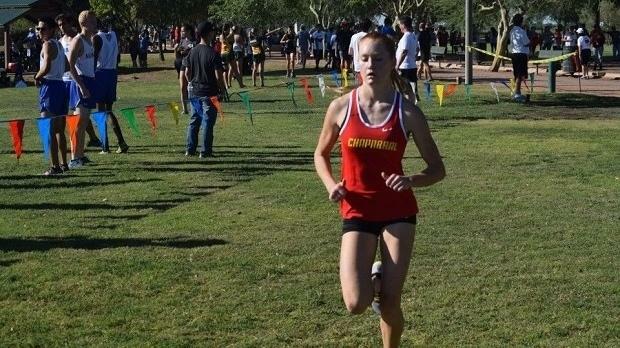 McLeskey most recently took 3rd at the Desert Solstice Festival two weeks ago breaking 19-minutes on a 3.2-mile course while Braun outkicked Welch 19:09 to 19:12 in the Girls Varsity race at Fountain Hills the next day. Alisia Honyumptewa (Chinle, Jr.) who recently won the Girls Varsity race at the Shiprock Invitational in New Mexico, will also compete at Doug Conley. When it comes to the overall team scores, Xavier is currently ranked no. 2 with a 43-second spread across numbers 1-5. They won the Girls Varsity race at Fountain Hills with a squad of non-Seniors. Meanwhile, The Highland Lady Hawks will return with the intent of keeping their title from last year. Chaparral will have a good chance of challenging Highland's girls' team with Archer and Turner, assuming they deliver the 1-2 punch that's expected. Best wishes to all at Shalimar Country Club tomorrow!